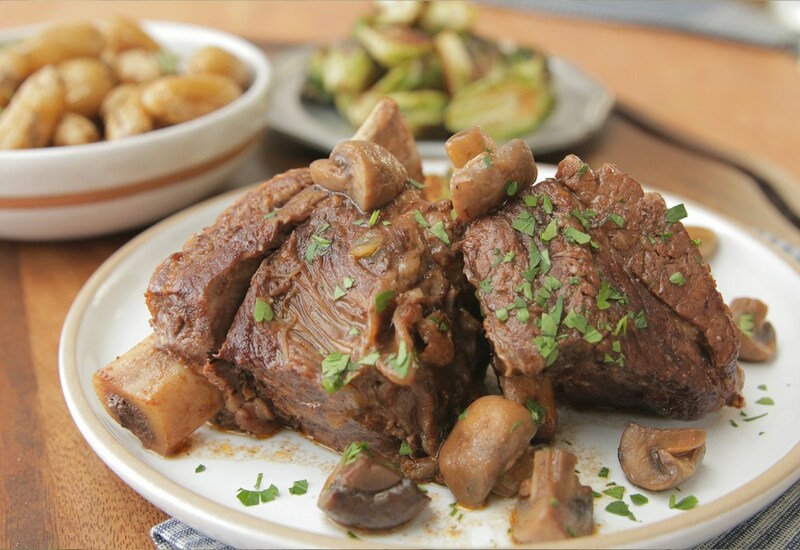 Short ribs have gained more popularity over the last few years, and for good reason. These rib cuts are full of great, meaty flavor and are perfect for cooking in the pressure cooker. Top them off with a flavorful mushroom sauce and your taste buds will be in heaven. Serve with fingerling potatoes or mashed potatoes for a fantastic, comforting dinner. Season ribs all over with salt and black pepper. Select Sauté on pressure cooker and pour oil into inner steel pot of pressure cooker. Working in batches, brown short ribs on all sides, 3 to 5 minutes per side. Remove ribs to a plate. Sauté onions in the hot oil of the same inner pot until soft and translucent, 3 to 5 minutes. Add red wine and tomato paste, scrapping up any bits stuck to the bottom of the pot with a spatula or wooden spoon. Cook until wine reduces slightly, about 2 minutes. Return ribs to pot and top with carrots, garlic, parsley, rosemary, and oregano. Pour beef broth over ribs and vegetables. Press Cancel to stop Sauté program. Lock pressure cooker lid in place and turn steam vent handle to Sealing. Select Meat/Stew and cook for 35 minutes on High Pressure. Let pressure release naturally for 10 minutes, then turn steam vent handle to Venting to quick-release remaining pressure. Transfer ribs to a plate. Strain and discard vegetables and herbs, and return cooking broth to inner pot. Add mushrooms to broth. Select Sauté and cook until mushrooms are soft, 2 to 4 minutes. Whisk water and cornstarch together in a bowl until smooth. Pour cornstarch mixture into broth, stirring constantly, until broth thickens slightly, 1 to 3 minutes. Season sauce with salt and black pepper to taste. Pour mushroom sauce over ribs, garnish with minced parsley, and serve. Tie the herbs together with a little twine to save yourself a little time when straining out the veggies and herbs from the broth. Per Serving: 952 calories; 67g fat; 10.9g carbohydrates; 71g protein; 264mg cholesterol; 536mg sodium. This the third time using the cooker and the first time my wife and I used it together. OK, I provided the technical guidance and she did most of the work. Bottom line, we both felt it was outstanding. Only question is was 4 cups of broth necessary? We had a great amount left over (which we froze to use with other meat dishes). I want to try the Short Rib with Mushroom Sauce; looks tasty! I was telling my mother that I was going to make this. My dad is an excellent cook and had attempted to do short ribs a few days ago (not in a pressure cooker). Mom said they were almost inedible because they were so tough. They will eat anything, so if she says they were almost inedible, most anyone else would have tossed them. I was already a little nervous about trying them due to this, then my husband said he invited a friend over for dinner (wipes sweat from brow). I was seriously thinking someone might have to do an emergency pizza run! They turned out perfect with this recipe! I served them with mashed potatoes. The meat was so tender, when it came time to clear the table, not a single knife had been used and there were barely any leftovers I would definitely recommend this recipe. Great recipe. Opted to keep the veggies and broth and make it more like a stew.